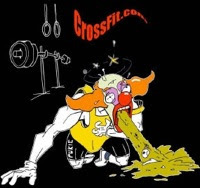 Rob Orlando 19 rounds + 3 bench, Jeremy Thiel 16 rounds + 3 bench,Kristan Clever 15 rounds + 2 bench (125lb bench, 155lb squat), Jake Cutting 14 rounds + 3 squat, Russell Berger 13 rounds, Nick Lobotsky10 rounds + 3 bench. Rob Estrella, Courage Games 2011. "A Power to Persuade" by Viginia Postrel, The Weekly Standard.